Welcome to the beginning of my Code Refactoring tutorial. 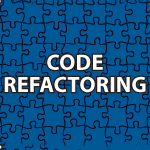 Code refactoring is used to improve code design to make it easier to understand and extend. Writing understandable code will allow others to easily modify it and in the end you’ll also find you write code faster because of code refactoring. I explain what it is in the video below as well as cover the refactoring bad smells and 2 code refactorings to get you ready for what is coming. The code used follows the video. Which constructor should be called? Wish constructors had descriptive names? I’m technically teaching everything I think some one needs to make great games. After refactoring I’ll cover algorithms and then I’ll move into 2D / 3D graphics. Then I’ll show how to make Java games and then I’ll move them over to Android and teach C and OpenGL with Android. just wanted to say thanks so much for these vids. I have been doing full time for a few months now, and your tutorials are totally fantastic. Presentation, explanation and content all 5 star! Derek — I appreciate so much your tutorial. I got a new job to work for a big corporation because I used your method during the job interview. It’s speak less of how to say THANK YOU! Thank you for this series, Derek. I have only watched the first video and learned much! Hey, The tutorials are very useful and I am thankful to you. I’m sorry, but i don’t understand what you need.